There is a reason why Tour Operators hire more ITMI Alumni...we have the most extensive training in the industry. We don't take short cuts in your training or in our support of your career. Yes, it's required by the State of California and because maintaining an A+ rating with the BBB for 40 years is good fun work. Students come to ITMI classes from throughout North America and around the globe. When considering places to stay during your class, ITMI works with a local hotel close to the training facility and negotiates special student rates. Student may select a single room or to share with a fellow student. Located in Marin County, the Holiday Inn Express - Mill Valley offers a picturesque location near the base of Mount Tamalpais, overlooking majestic mountains, peaceful wetlands and bike paths, yet minutes from the vibrant city of San Francisco and all the city has to offer. Experience exceptional service, thoughtful amenities, and luxurious accommodations featuring a welcome refreshment, high-speed wireless Internet, 24-hour Business Center, plush new bedding, refrigerators, in-room DVD players, DVD library, Stay Smart shower heads and ergonomic work desk. Enjoy the outdoor pool under a private cabana, Fitness Center, s’mores by the fire pit, hot breakfast buffet and bike rentals. Modern amenities complement the historic Crystal City location. Located near Washington, D.C. and Old Town Alexandria, the hotel provides access to popular sights including the White House and Smithsonian museums. They also feature complimentary airport shuttle to and from Ronald Reagan Washington National Airport. Retire after a busy day to our rooms and suites equipped with free high-speed Wi-Fi. Work from our large in-room desks or unwind on our plush beds with crisp linens and fluffy pillows. In your free time, break a sweat in our 24-hour fitness center with cardio machines and free weights. Click here for additional hotel information. The hotel is situated in one of downtown Vancouver's best neighborhoods just minutes from Granville & Robson Streets, Davie Village, Yaletown, Granville Island and the city's breathtaking 22-kilometer seawall. The designer rooms and suites have been created with premium furnishings, sparkling new bathrooms and an impressive list of in-room amenities including HD flatscreens, free WiFi, free in-suite Keurig Espresso machines and fully stocked bar fridges. 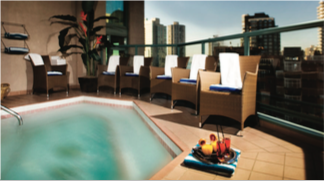 We feature the exclusive landscaped & sky-rooted Chaise Terrace Lounge to chill while overlooking the city and a lush 9th floor sun deck and skyview hot tub oasis. Complimentary signature amenities include in-town BMW X5 chauffeur driven limo (based on availability), cruiser-style bike rentals, a nightly wine tasting reception, in-house cardio fitness centre overlooking the city, bottled spring water replenished daily and a fully equipped business station. Click here for additional hotel information. AirBnB connects local hosts with visitors searching for unique places to stay. Founded in August of 2008 and based in San Francisco, California, Airbnb is a trusted community marketplace for people to list, discover, and book unique accommodations around the world, online or from a mobile phone or tablet. Whether an apartment for a night, a castle for a week, or a villa for a month, Airbnb connects people to unique travel experiences, at any price point, in more than 34,000 cities and 190 countries. And with world-class customer service and a growing community of users, Airbnb is the easiest way for people to monetize their extra space and showcase it to an audience of millions." Use hihostels.com to book hostels all over the world! Check out youth hostel reviews for and visit our Tripbooks for help with your traveling. Whether you're a backpacker, on a gap year, travelling as a student, touring as a family or simply looking for a holiday - we can help. From private rooms to a dorm bed for the night with shared facilities, all HI hostels meet assured standards which guarantee good quality safe accommodation at affordable prices. Browse our hostel destination suggestions, get inspired by activities and events - then choose your accommodation package. We look forward to welcoming you soon.